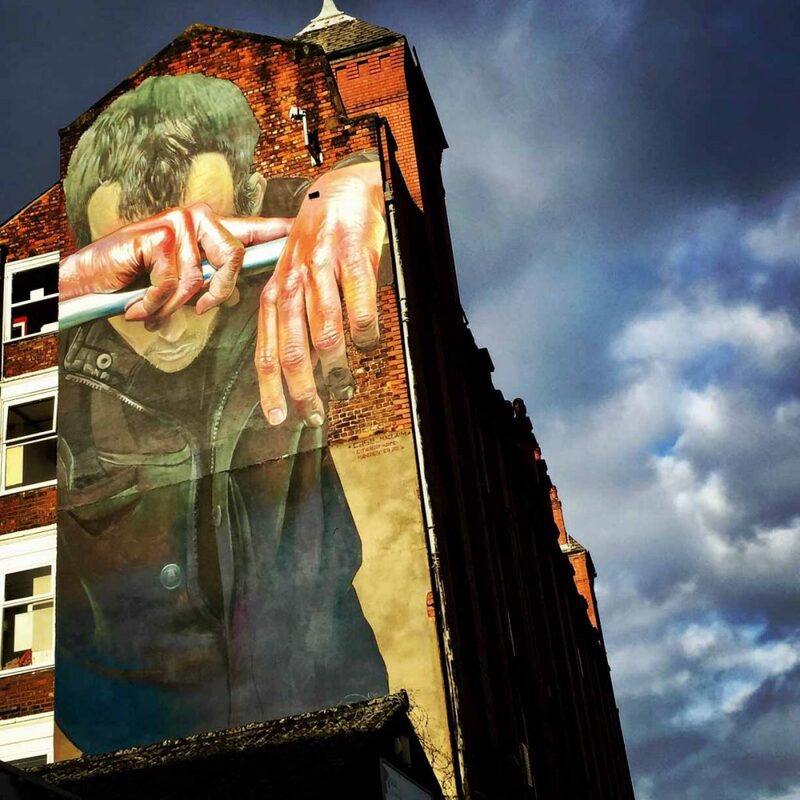 Manchester is home to some of the most evocative and challenging street art in the whole country – centred in the Northern Quarter, it’s a key part of the district’s soul and energy. London might have great art too, but no district has the sheer density of rich boundary-setting work that Manchester’s northern district does. 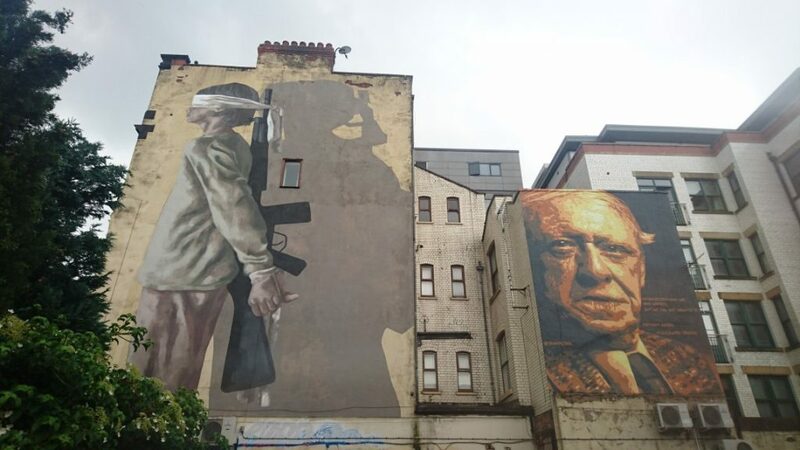 This reputation for powerful, thought-provoking work was confirmed during the street art festival Cities of Hope, which raised money for different Manchester charities by crafting incredible works of art, many large enough to cover their entire building. Each raised awareness about a different cause. 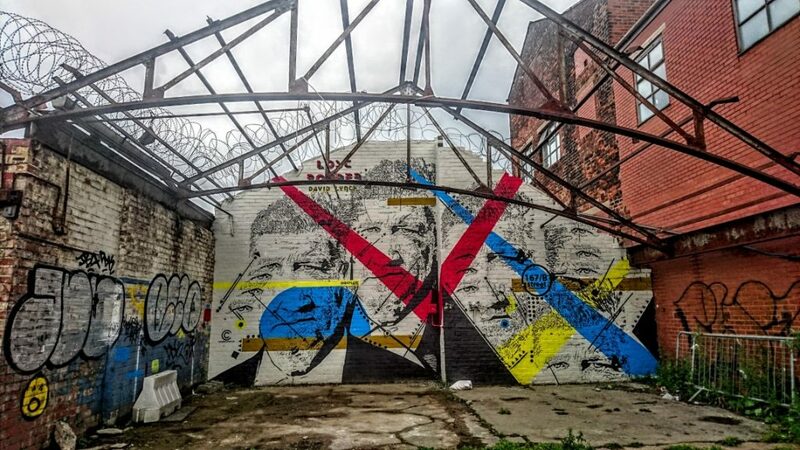 So in between some great eating and drinking, take a trip with us through this beautiful open-air art gallery that is the Northern Quarter and see some of the city—and the country’s—best. 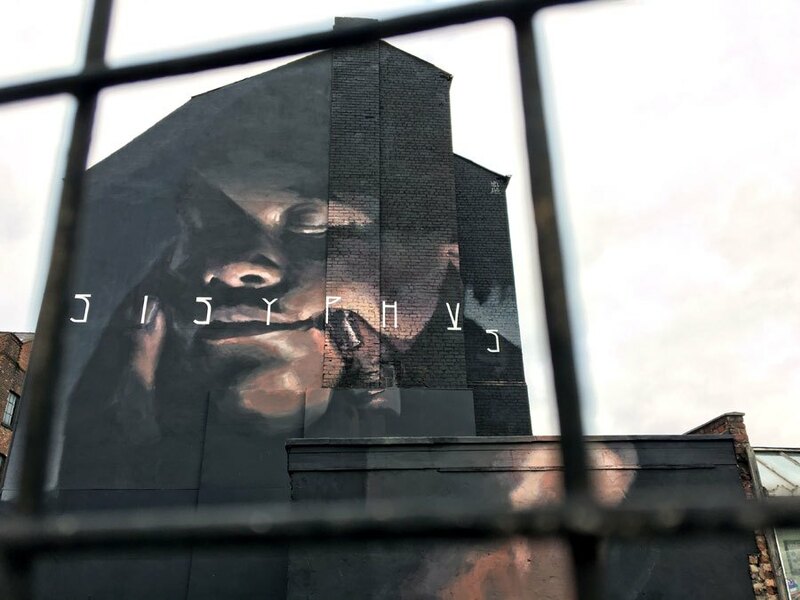 And now, a little disclaimer: one of the most frustrating (but also powerful) things about street art is that it doesn’t last, the way a portrait in a museum does. Not every piece listed here is guaranteed to be there by the time you discover them. This piece by the Never Crew highlights the world-upending difficulties of the modern refugee crisis. The more you stare at it, the more disturbing and tragic it becomes. 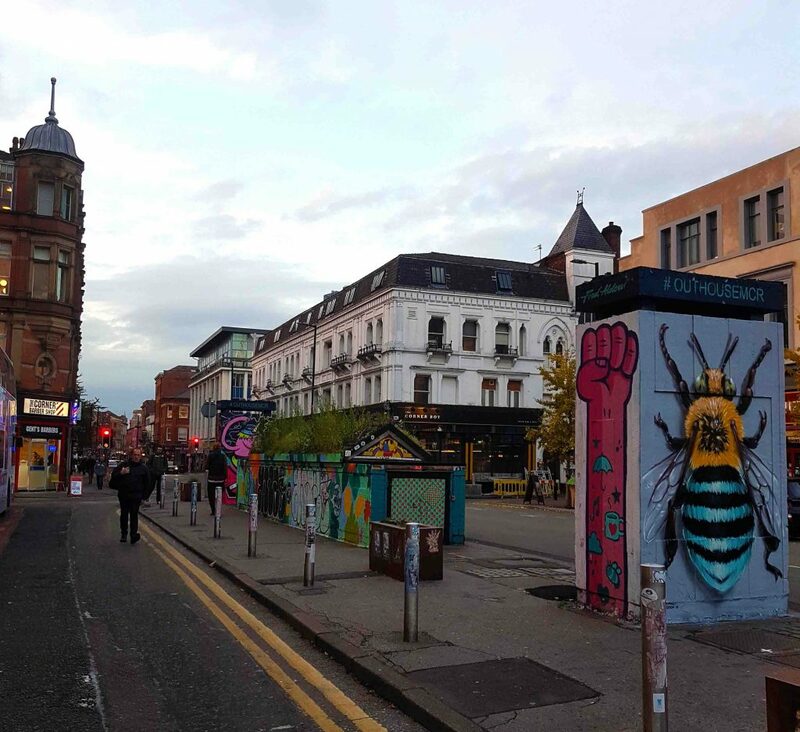 Stevenson Square is the place most visitors will notice when they first start exploring the Northern Quarter. This place is filled with great public art which changes from season to season (when I went there was a great portrait of a bee and some pop art that looked like it could’ve been done by Jamie Hewlett of Gorillaz fame). That’s what keeps it exciting – who knows what you’ll find there? 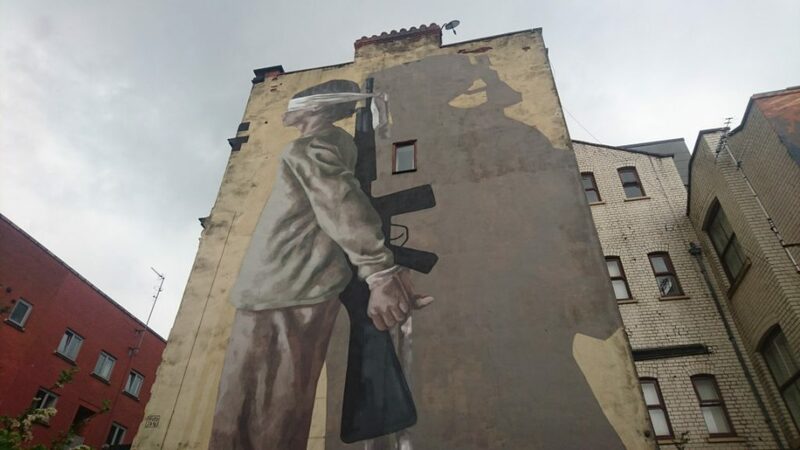 War Children by Hyuro is a powerful indictment of the way civil war impacts people at all levels of a society – in this case, a teenage girl forced to fight for the men above her (depicted by the shadow at her back). Detailed and yet surreal, expect to stand at this one a while. And then only a house away is another moving portrait, this one by Polish artist Tankpetrol. It’s a depiction of A Clockwork Orange author Anthony Burgess, probably the most famous Manc writer. Dale Grimshaw’s powerful Cities of Hope peace is a tribute to West Papua independence; it’s certainly the most colourful piece you’ll see today. Then turn a right on Houldsworth until you reach the car park. This one may take a few minutes to find, but it’s well worth the hunt. This mural by Chekos is hidden away in the car park between Port Street and the canal. It celebrates the legendary auteur David Lynch, using some of his mind-melting artistic flair to capture him. 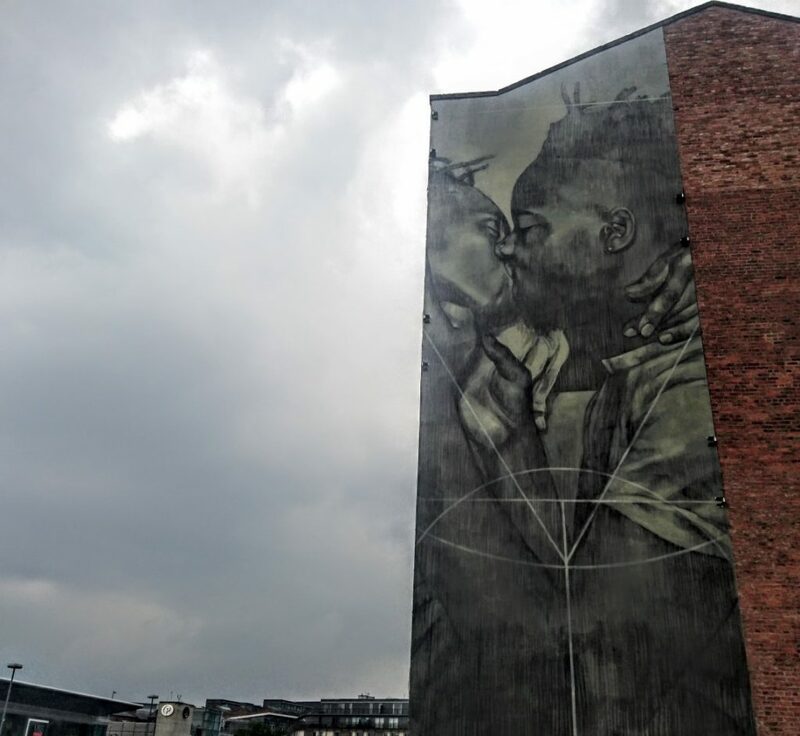 Certainly one of the most moving street art mainstays in the city, Faith 47’s wall-high painting on the back of a warehouse is a powerful statement for gay rights. This one was by the famous Spanish street artist Axel Void. 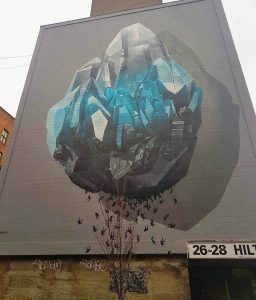 A Cities of Hope commission under the theme of existentialism, Void takes on the myth of Sisyphus (the man condemned to roll a boulder up a hill for eternity) and brings it into the 21st Century. 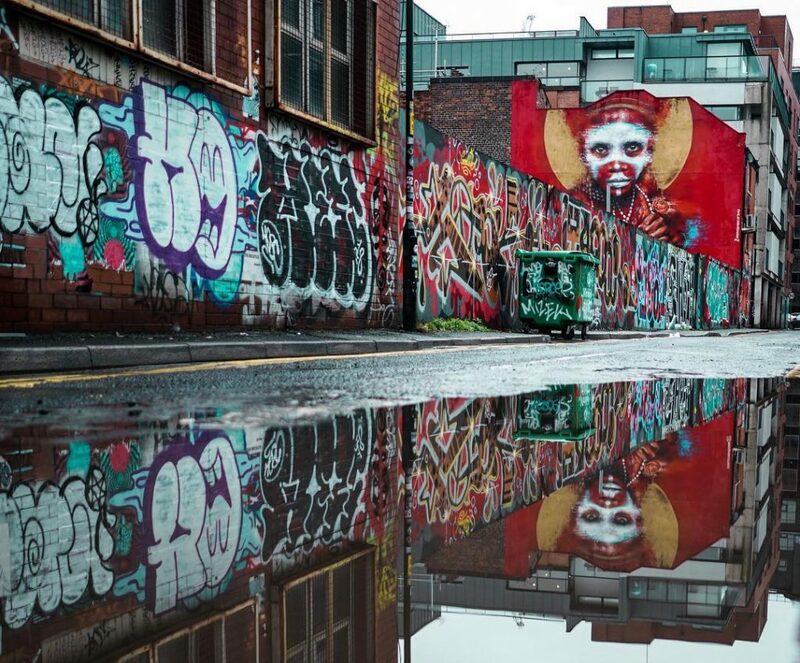 It might not be clear what he means here, but the stunning use of colour and visuals rank it among the city’s best. This one was done by the artist Case for Cities of Hope, focusing on mental health issues and disability, teamed up with the charity “Back on Track” to showcase one of the people in their program trying to make positive changes in their life – and the difficulty that comes along with that push. After that, swing back down to Church Street only a couple minutes away. You’ve only covered a very small area of the city, but it will feel much larger – after having seen so many perspectives and challenging visions (because you definitely saw more than the ones featured here), you’ll have covered a lot of emotional ground. But it’s in moments like these where you see exactly what makes Manchester such a special city – its vibrancy, boldness, and heart.